Jim is, as usual, in the middle of a monologue about the merits of sporting disciplines: rock climbing. Jeremy is asked to attempt the climb and his pitiful performance earn him bitter bullying from Jim. He falls and becomes ashamed, turning to Aelita who tries to comfort him. Nonetheless, the fall gets to Jeremy, who questions the whole thing in the cafeteria. Aelita assures him that he can’t be a champion at everything. The discussion turns to the Skidbladnir and the tests they need to run on it. The Lyoko Warriors insist they do a test immediately. Jeremy disagrees, but an opportunity presents itself: all afternoon classes are cancelled, replaced by a security exercise day with the firefighters. The heroes head for Sector 5. All seems operational, in the Skid hangar they stand on platforms that teleport them into the Skid, Aelita at the wheel, the three others in mini compartments attached to the Skidbladnir: the Navskids. 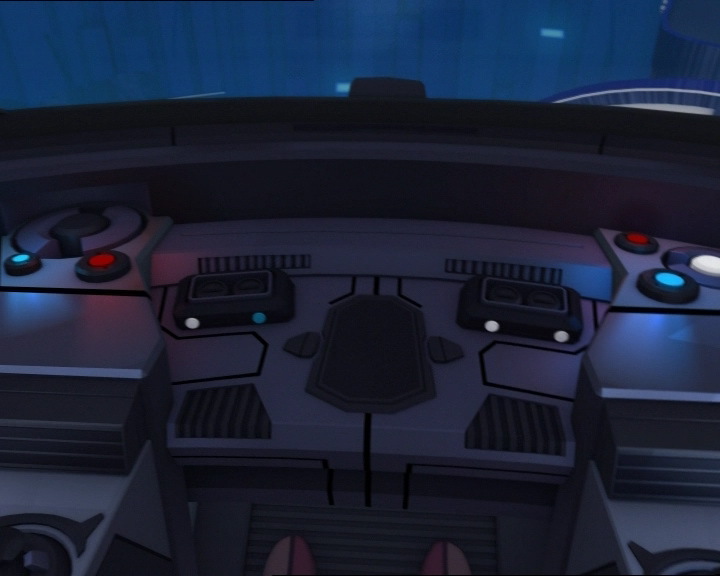 “For you, Daddy…” These are the words Aelita utters before she fires up the engines and pulls away from the dock. The submarine leaves its hangar at the north end of Sector 5, then takes a tunnel to the Desert Sector sky. Jeremy is happy about their success and asks them to come back in. The virtualises friends insist otherwise: they’re not there to return immediately; they want to go into the Digital Sea…Jeremy is sceptical but gives in: a dive no longer than five minutes! The Digital Sea. A vast, blue ocean. In the water are databases attaches to an invisible platform, giving the impression of an upside-down city. Tubing connects the databases to one another. Aelita pilots through them, everyone looks in admiration. Suddenly a bug occurs: the navigation system fails completely. Jeremy loses all trace of the Skid! Via vocal contact, he warns Aelita. The situation is more dramatic than it appears! 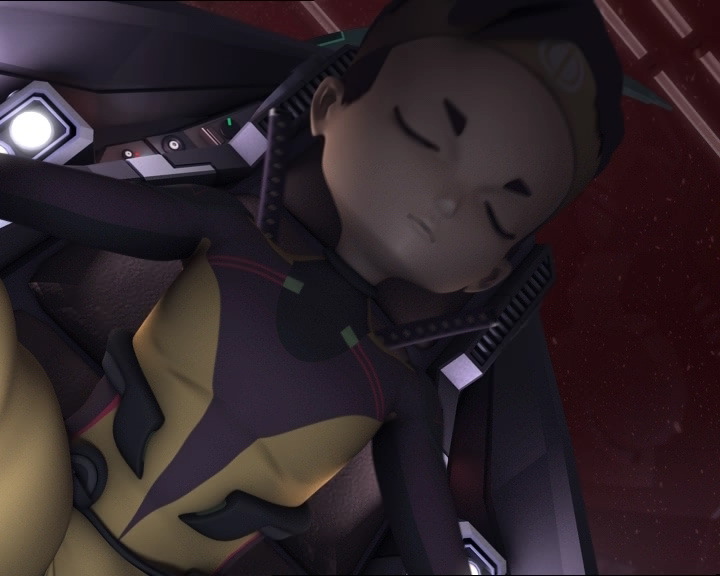 It’s impossible to guide them back to Lyoko, and when the Skid loses all its energy, it will disintegrate and the heroes will be virtualised forever! He needs to fetch a CD to debug everything…at the school. In a dash resembling the one in episode 25, Jeremy returns to Kadic and runs into the insurmountable and inescapable Jim. He forbids Jeremy from accessing the buildings: the security day is in progress. He makes the error of turning his back, telling the firefighters about when he fought forest fires! Jeremy takes advantage of this to get into the building… Unfortunately, teachers are everywhere and to reach his room, Jeremy has but one option: the roof! Climbing for the second time that day, only just avoiding killing himself, Jeremy reaches his room and legs it out of Kadic, apologising to the surprised firefighters! Meanwhile, the Skid hasn’t stayed in one place and instead continued to explore. Suddenly, the Digital Sea turns red. 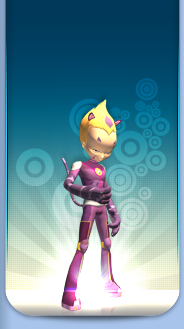 The heroes approach dangerously close to what they thought was Lyoko… They then realise they were wrong… It’s a virtual world, just like Lyoko, created by XANA: a Replika! Aelita moves away from it but the heroes then run into disconcerting enemies: Kongres! The fish of the Digital Sea shoot double lasers from their eyes! Aelita dodges them, taking the Skid through some dangerous manoeuvres. Jeremy then returns to the factory and inserts the CD. Nevertheless, debugging the Skid will take time, and the submarine is losing energy trying to escape the Kongres. They need to buy time: the Navskids are released from the Skidbladnir, the heroes take control and face the Kongres. They cope very well, Odd destroying one of the digital fish with his torpedoes. Ulrich misses, but rams his Navskid violently into the second one. The navigation system repaired, the Navskids return to their mothership. Aelita engages maximum propulsion: the empty-handed Kongres watch the submarine escape at speeds they could only dream of. For the heroes, it’s time to head home! In the lab, are discussing the rather positive assessment of their exploration, but especially the Replika: they need to find out why XANA created it. Jeremy says that he’s wiped out and wants to sleep. 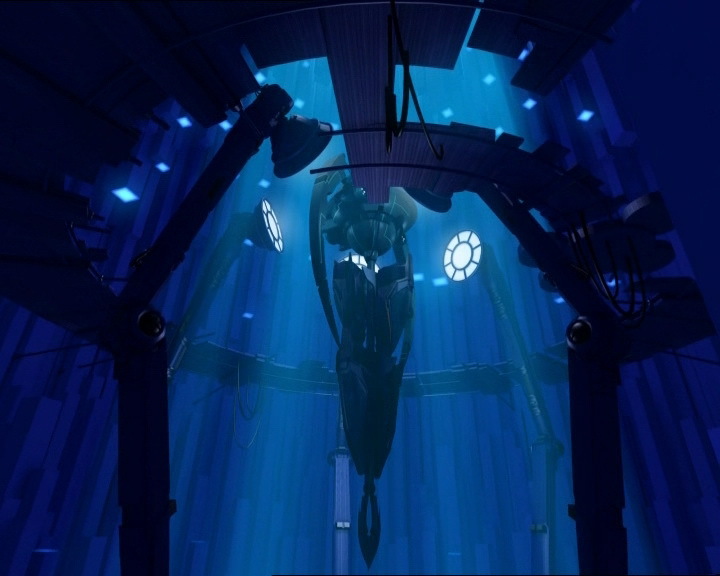 - Discovery of the Skidbladnir’s station in Lyoko. - Discovery of the functioning of the Nav Skids. - First season 4 episode in which William does not appear. - Jim was a firefighter. - Aelita says she loves Jeremy despite him being terrible at sport. - Aelita's pants disappear in two shots in the cafeteria. - The principal's eyebrows are grey at the moment when he announces that all classes are cancelled. 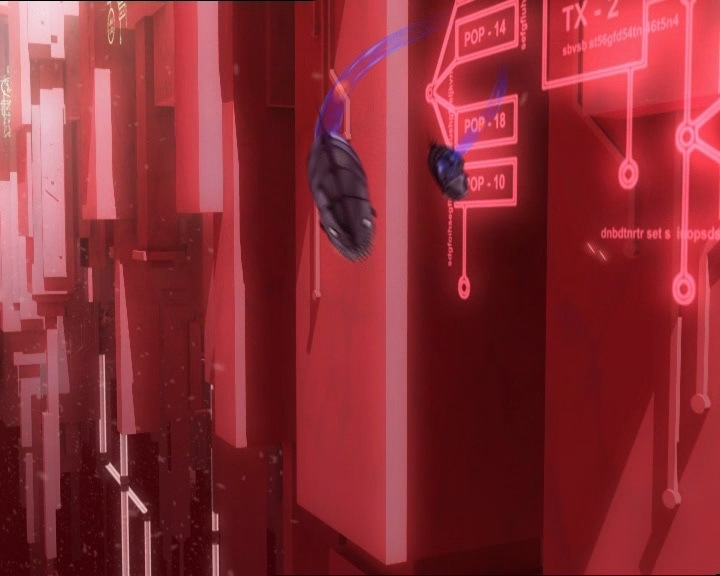 - Aelita's earring is on the wrong ear when Jeremy asks what the network looks like. - When Jeremy is on the roof of Kadic one of the attic windows is half-open, and in the following shot it's fully open. 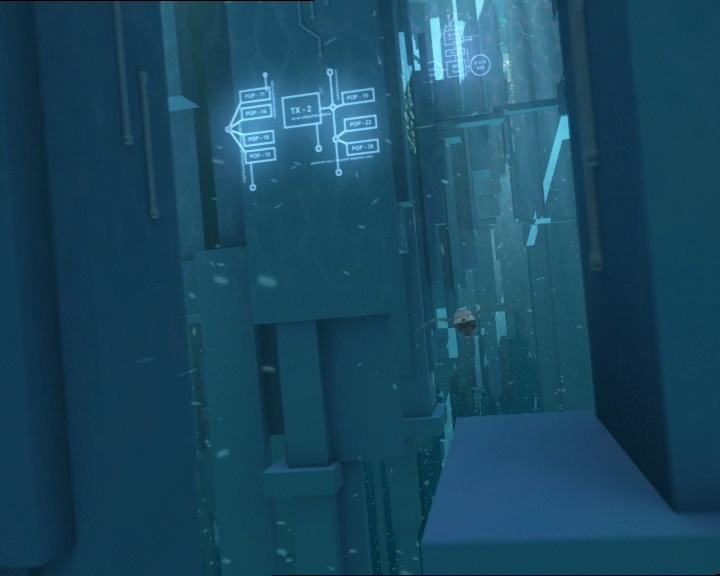 - The factory microphone appears and disappears from Jeremy's ear when he talks what he did while Ulrich, Yumi and Aelita were in the network. - Odd says that the Navskids are more manoeuvrable than the Overboards. But there is only one Overboard, so he should have said Overboard in the singular. - First mention of Replikas. - First mention of Kongres. - First mention of the Holoweb. 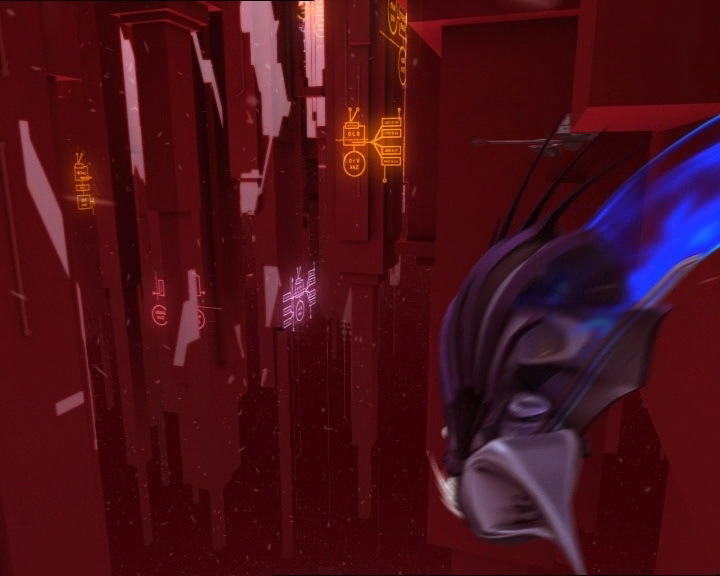 - First mention of Lyoko's gravitational pull. - The access code from the lift into the lab is 713051. - New allusion to the video game Galactic Battle (also called Galactic Invaders). First mention by William in episode 65 “Final Round”. Helium is a very light gas. 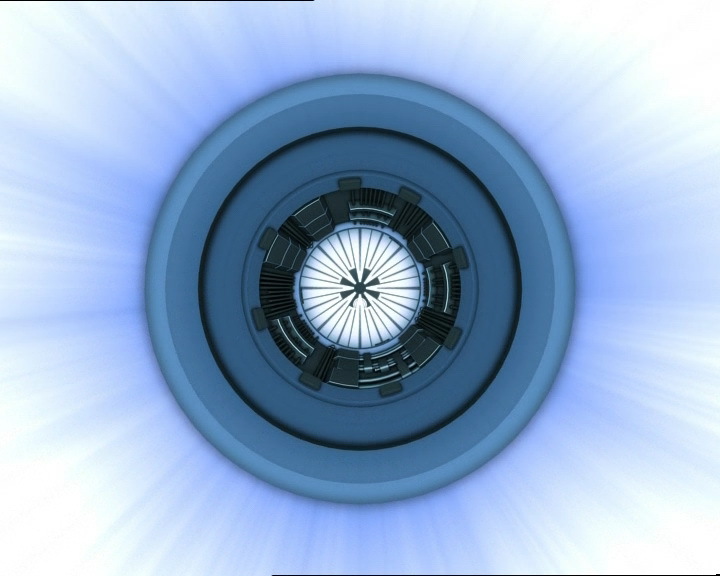 - The background music in the network is derived from “The Blue Danube”, an opera by composer Johann Strauss II. We can suppose that one of the members of the Moonscoop team is a fan of Alfred Hitchcock, as the famous director adapted it for cinema under the title “Waltzes from Vienna”! Episode 58 “The Pretender” already makes a large allusion to Hitchcock! - Jim alludes to Mount Everest, which is the tallest mountain in the world, part of the Himalayas. Fort Knox is a large army base in Kentucky, USA. It nearby the United States Bullion Depository, also sometimes known as Fort Knox, which is famously known as the most secure vault in the world. This is where the association between Fort Knox and security comes from. - The name of the game Galactic Battle was changed to Galactic Invaders in this episode. This makes it sound similar to the game Space Invaders, an old game in which the player shoots down rows of alien spaceships that are trying to land. Jim: For those who are not familiar with the sport, rock climbing is a noble discipline, which can carry you to great heights! Jim: And so, don’t forget that only by challenging yourself can you move mountains, and might I add, climb them. Jim (to Jeremy, who fell from the wall): Of course if the only exercise you get is clicking your computer mouse, you’re not gonna conquer any peaks! Sissi: Well sourpuss, having a hard time lifting your brain with those string bean arms? Odd: Aelita, I hate to talk with my mouth full. Would you mind taking over? Aelita: Sissi, your head is so full of helium, you can float to the top! Jeremy (to himself): I don’t believe it…I can’t be that bad at every single sport! Aelita: Of course not! …actually no, you really are lame at anything athletic! Anyway who cares? You can’t be a champion at everything! Mr Delmas: Quiet down, please! I said quiet down! Quiet, I said! Jim: MISTER DELMAS SAID QUIET DOWN, AND THAT MEANS NOW! Mr Delmas: Ahem…thank you, Jim. Aelita: Yumi is right, you know. We’d better make a trial run in the Skid, just to see how it works. Jeremy: Yeah, but I don’t know if we’re ready yet. Ulrich: We’ve got to try it out before XANA gets even more powerful! Jeremy: Well ok, we’ll take advantage of the safety drill to get over to the computer lab. Aelita: Way to go, Jeremy! Jeremy: But I don’t have enough data to tell you exactly what you’ll find, it’ll be a surprise! Odd: That’s fabulous, I love surprises! Well, what are we waiting for? Odd: Don’t bother, we’ll work it out as we go along. Nothing like hands-on experience! Aelita: Cockpit to Navskids, do you read me? Odd: This is cool, it’s like being in a spaceship! Ulrich: Yeah, but be careful, Odd. This isn’t Galactic Invaders! Odd: Yeah, yeah! You’re just jealous ‘cause I wiped out three times as many aliens as you did last night! Ulrich: Because you cheated as usual! 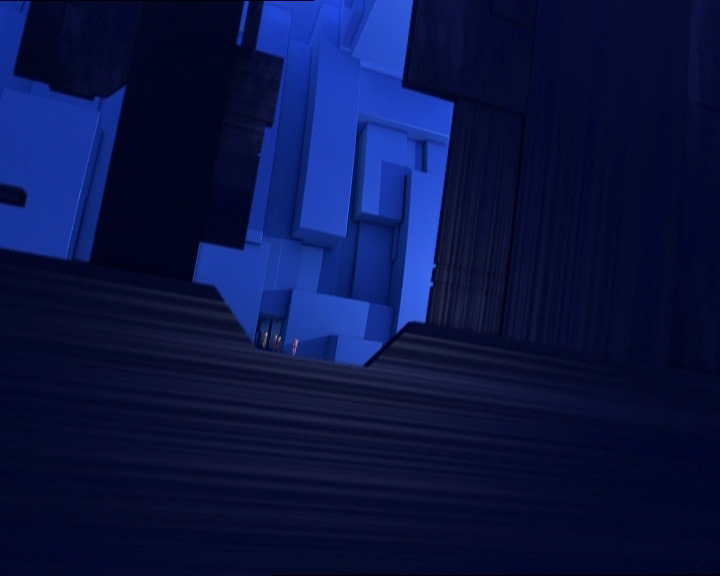 Aelita: Don’t you wanna see what the network looks like? Jeremy: Ohhh…I feel like I’m going to regret this, but ok! Aelita: Skid to base lab! Jeremy: Aelita! I don’t know why, but I just lost all trace of you on my radar. It might just be a transmission problem, can you check it out? Aelita: Jeremy, the navigation system doesn’t respond. There’s a bug in it! Jeremy (crushing the can again): This can’t be! 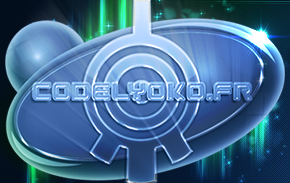 Without a navigation system you’ll never find your way back to Lyoko! You’ll be stuck, floating on the network until you use up all the Skid’s virtual power reserves! Jeremy: Once the virtual energy is exhausted, the Skid’ll break up, and you’ll all end up in the Digital Sea for good! Odd: By the way, Einstein, I hope you’ve got a solution because I didn’t bring my bathing suit! Odd: Oh that’s cool, Einstein. You couldn’t have brought the stuff with you? Jeremy: Hey, I wasn’t the one who insisted on doing this trial run, Odd, so just cool it if you don’t mind! Jeremy: Whatever you do, don’t move from there! Jeremy: I need to get something from my room, i-it’ll just take a second! Jim: Oh no you don’t! You were all warned this morning, and a warning in hand is worth two in a…bushling! Jim (to the firefighters): Did I ever tell you about when I fought forest fires? Jeremy (talking about the teachers posted all over the school, including inside the dorms): Another teacher standing guard? What is this, Fort Knox?! 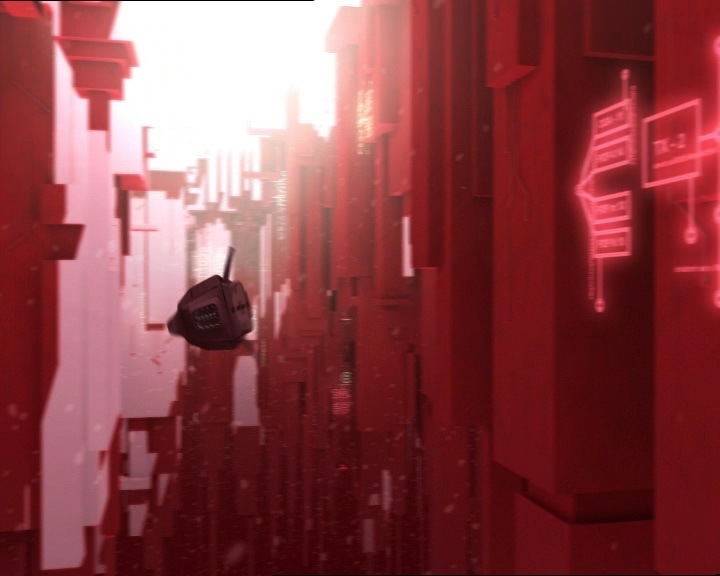 Yumi: Aelita, you think that’s Lyoko? Aelita: I don’t know, but whatever it is, its gravity is pulling us towards it! Jeremy: This is not gonna be a piece of cake! Ok…let’s do it! Odd: Oh, I’d love to see that paper-pusher Einstein’s face when he figures out that we didn’t need his help to come back in! 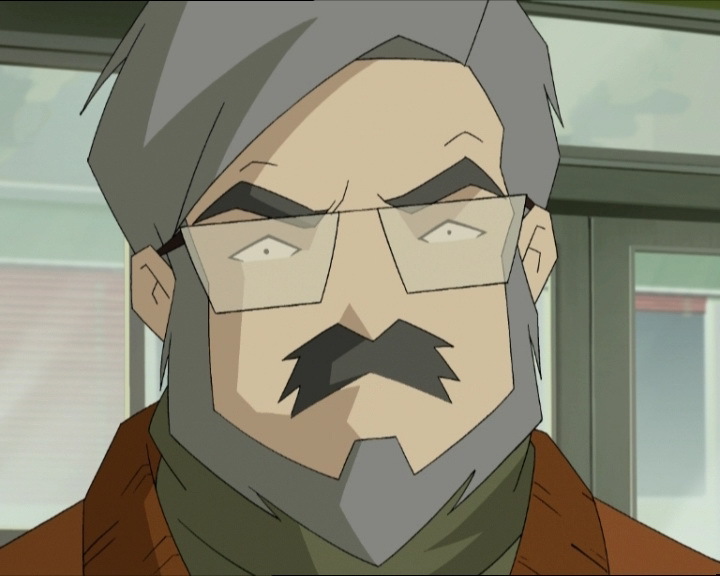 Ulrich: Yeah, nice to be back on Lyoko! Aelita: But it’s not Lyoko! Aelita: It’s not Lyoko! Hang on now, retro brakes! Jeremy: Who said climbing can take you to great heights? …I guess I should monkey around more often! Yumi: There’s something else up ahead! Ulrich: Hey look, it’s Ugly and Uglier! They look like some sort of eel! Odd: I’ve never met an eel I didn’t like! Odd: I’ve seen spiked heels, but spiked eels? Never! Jeremy: Sorry! Got my own fire to put out! Odd: Holy cow, Aelita! Be careful, or you’ll get us all killed! Who taught you how to pilot?! Odd: What? We’re gonna fight them one-on-one? Jeremy: Exactly, Odd! Just like in Galactic Invaders! Odd: Hey, these are more manoeuvrable than the Overboards! GANGWAAAAY! Ulrich: Hey, fish freak! Lookin’ for some more bait? Jeremy: I would never have thought that the world information network was a real live ocean! Odd: Yeah, with fish and everything! Big ones too! Ulrich: That huge sphere we saw, what was that anyway? Ulrich: We’ll go and explore it! Jeremy: Right. But not tonight! The only thing that I feel like exploring is my bed, I’m wiped out! Odd: You’re wiped out from sitting in your cushy chair? How do you think we should feel then? Jeremy: Odd, if I told you what I was doing while you were on the network, you’d never believe me! Odd: Lemme take a wild guess, ok? Uh, you did a little rock scaling on the dormitory roof? Jeremy: Huh?! But how’d you know that?! Odd: You know, Einstein? You can be really hilarious when you wanna be, even when you don’t wanna be!